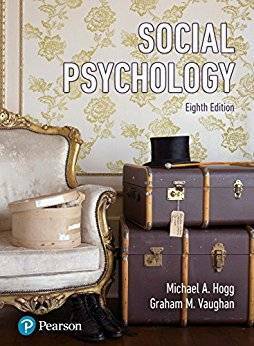 The eighth edition of this lively introduction places social psychology in a contemporary, real-world context and explores new, cutting-edge research as well as bringing classic theories to life. Thoroughly revised to enhance accessibility, and updated to include over 250 new references, this trusted, market-leading, cutting edged textbook remains as comprehensive as ever. · Research Classic and Research highlight sections focus on either seminal or contemporary areas of research to help you to refine your understanding of these key areas. · Your Life sections explore everyday social psychological and encourage you to apply the ideas within your own life. · Our World boxes consider examples of social psychology or social issues within the wider world to help you gain a deeper and applied understanding of concepts and issues. · A range of photos, reflective questions and the film/literature and TV section in each chapter further help to bring alive this fascinating subject for everyone.